3 Beds 1 / 0 Bath 1,703 Sq. ft. 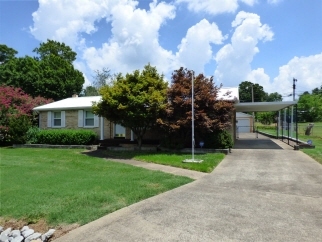 Description: All brick 3br/1ba ranch home with metal roof. Great room, huge eat-in kitchen and separate bonus room. Large sun room overlooks fenced backyard. 1-car carport plus 2-car detached garage/workshop. Separate storage building in backyard.